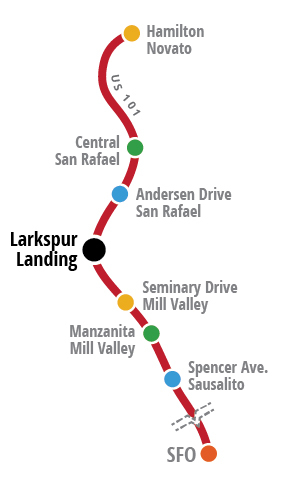 Departures: Buses pick up in Larkspur every 30 minutes, on the hour and half-hour, from 4:00 AM until 11:00 PM. The trip to SFO takes a minimum of one hour, but may take longer depending on traffic conditions. Tickets may be purchased from your driver for cash, from the cashier at the Andersen Drive terminal, or online through the link below. Tickets purchased online may be printed and given to the driver, or you can display the ticket on your phone. Please be sure to complete your ticket purchase before boarding the bus so as not to delay the boarding process. Or Click Here for more detailed e-ticket instructions. Pickup to SFO is on Westbound Sir Francis Drake Blvd., at the bus stop, next to Marin Country Mart. Drop off location when coming from SFO to Marin is normally across the street, on Eastbound Sir Francis Drake Blvd., next to the Golden Gate Ferry parking lot. There is no long term parking available for Marin Airporter customers at Larkspur Landing. Street parking subject to posted limits.